Metter’s Sons of Confederate Veterans, The Dixie Guards Camp #1942 held their 4th annual Lee-Jackson-Longstreet banquet Saturday, Jan. 28th at the Western Steer Restaurant. The Dixie Guards sponsor the banquet to honor the January birthdays of Confederate Generals Robert E. Lee, Thomas J. “Stonewall” Jackson and James Longstreet. Eighty-eight people attended the banquet, which featured as keynote speaker, the national commander of the Sons of Confederate Veterans, Denne Sweeney of Texas. Sweeney discussed why it is relevant to be a member of the Sons of Confederate Veterans in the modern age of political correctness. Sweeney compared the modern southern United States to England’s Scotland in treatment and history. Sweeney, who is a West Point graduate, also outlined the tradition of military service that is a cornerstone of the American South. The meeting was highlighted by the appearance of Mrs. Katie Johnson Love, an actual daughter of a Confederate veteran. Mrs. Love was introduced and welcomed with a standing ovation. Mrs. Love’s father was Private Richard Johnson (b. 1850 – d. 1944) of Company K, 46th Georgia Infantry who served in the Augusta Powderworks. Mrs. Love presented Commander Sweeney and his wife with a king-size confederate-themed quilt made with her own hands. The Robert E. Lee Confederate of the Year Award was given to Carlton Clifton for his untiring efforts at fundraising and renewals. The James Longstreet Officer of the Year Award was given to Jason West for his consistency and reliability. The Thomas J. Jackson Recruiter of the Year Award was given to Tony Thompson for recruiting the most new members. The Nathan B. Forrest Defender of the Cause Award was given to Gary Coleman for his song about the sinking of the CSS Georgia and his work in the armed forces while serving in Iraq. The Dewitt Jobe For the Cause Award was given to Jay Clifton for educational outreach and devotion to living history. The Richard Kirkland Good Samaritan Award was given to Wayne Lesesne for spearheading charity efforts particularly those honoring the wounded veterans at the Veterans Hospital in Dublin, Ga. The Ladies' Auxiliary Award was given posthumously to Gladys Denning for her enthusiastic support and was accepted by her son, Bradley Denning. The applications of new members Gerald E. Nobles Sr., Kyle Lively and Sonny Morgan Jr. were accepted. Commander Sweeney then officially swore in all new members who joined since August. 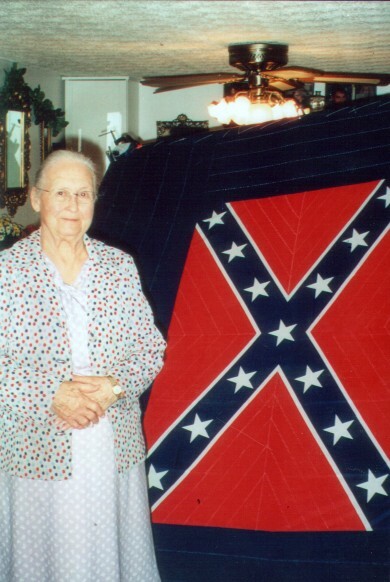 Mrs. Katie Johnson Love, an actual daughter of a Confederate soldier, is shown at left with one of her handmade Confederate themed quilts. Mrs. Love presented a quilt to the head of the national Sons of Confederate Veterans organization, Denne Sweeney, during his recent visit to Metter.